SOFIA, Bulgaria, February 27, 2012 (ENS) – The rapid thawing of Europe’s second longest river, the Danube, has sent huge ice floes slamming into boats and bridges, causing widespread damage to river vessels. A ship carrying 700 tons of corn sank Sunday night in southeast Romania; no injuries were reported. Earlier this month the river froze along the Bulgarian section for the first time in 20 years. Near Silistra, a port city in northeastern Bulgaria on the border with Romania, the river froze again after warmer temperatures produced a thaw on Monday, sending ice racing downstream, smashing port infrastructure. In the municipality of Purvomai, 16 villages were inundated over the weekend. In one of the hardest-hit villages, Vinitsa, water flooded 50 houses, shops and outbuildings, reports “The Sofia Echo” newspaper. No one was injured although large numbers of animals drowned. Disinfection of sources of drinking water in the region had started, said Bulgarian National Television, BNT. The Bulgarian agency for exploration and maintenance of the river said during the past 24 hours the water level near Ruse has fallen, and currently the situation remains serious only in Silistra and Tutrakan. 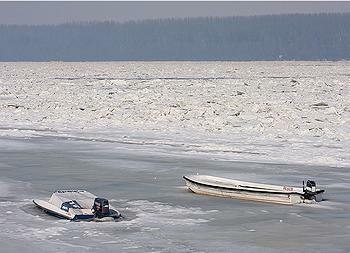 BNT reports that officials from Bulgaria and Romania are discussing how to avoid the consequences of ice drifts. Experts ruled out the option of detonating large ice floes, a practice that was implemented 27 years ago. Destructive floods caused by the rapid thaw could add to the hundreds of fatalities from an already harsh European winter, warned the head of the United Nations agency dealing with disaster risk reduction. Margareta Wahlström, the head of the secretariat of the UN International Strategy for Disaster Reduction, expressed concern for those countries crossed by the Danube. “The thaw is now setting in along the Danube. While thousands of people remain snowbound from Serbia to Bulgaria, there are warning signs that destructive floods will add to the loss of life and economic assets particularly in places where there is an absence of flood management infrastructure such as dams and dikes,” Wahlström said. The Danube originates in Germany’s Black Forest and flows southeast for 2,872 kilometers (1,785 miles), passing through four Central and Eastern European capitals before emptying into the Black Sea through the Danube Delta in Romania and Ukraine. 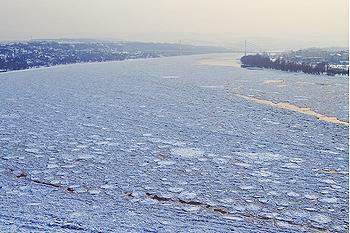 This winter’s cold front had frozen large stretches of the waterway, blocking navigation in parts of Germany and the Balkans. Wahlström praised Bulgaria’s decision to inspect more than 500 dams throughout the country and to release the water from some dams and reservoirs to control the floodwaters. Wahlström said the European Flood Alert System could be put to its greatest test since widespread flooding 10 years ago led to its creation by the European Commission. The European Flood Alert System was launched following the devastating Elbe and Danube floods in 2002, a year when 20 European countries experienced severe flooding.